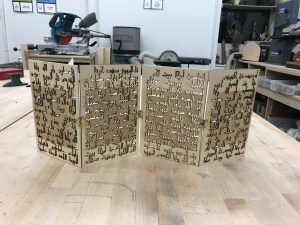 I wanted to explore the possibilities offered by the laser cutting technology as a new medium to assess in my creative process and add to my tools of making. My target was to create an object that addresses my thesis research and complements the other objects created for this purpose. I have been grappling with the idea of creating an interactive installation cube that represents confinement. I was not sure what material I should employ for this purpose. 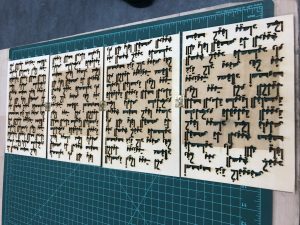 However, looking at examples at the Rapid Prototype Centre (RPC) as well as The Joy of Laser Cutting website has inspired me to direct my laser cutting assignment for this end. For this project, I decided to do something related to my thesis work. 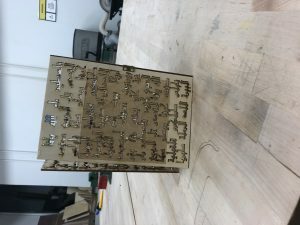 From the instructions and examples shown in class, I figured out that preparing a design for laser cutting is much simpler and more doable than for 3D printing. Thus, I would be able to bring to life concepts that have been playing in my head. Since confinement and inaccessibility are issues that are closely related to my theme, I was inspired to create a monumental cage that is beautiful and yet prison-like which offers no way out. This reflects the situation in the Palestinian city of Gaza, where people have been confined there for over a decade, turning Gaza into the biggest open-air prison in the world. How would I relate this cage to my research and turn it into a meaning making object? From the beginning, I knew I wanted to create cuts into the “walls” of the cage. Those cuts are windows to the world for Palestinians living in Gaza. The social media has become their windows to the outside world. Palestinians, including artists, have reported that they know how the world looks like from images and videos they see on social media. They have also learned skills through you tube. In addition, the cuts on the wood represent the skies they are permitted to look at, and the great Mediterranean Sea they have very limited access to. Furthermore, they depict the disturbances of Palestinians’ lives in general and the harsh reality they have been living since Nakba in 1948. What should my design cuts represent? It is always hard to try to come up with a design idea within a short period of time. In my opinion, ideas mostly pop up into your head or visit you in your dreams, although some brainstorming can help develop ideas and concepts. In this case, the concept is already there, therefore the next question is what should the design cuts represent or look like? an image, drawing, illustration? Soon after, I decided to use words that describe this situation and the circumstances that created or lead to it. I thought of words like displacement, confinement, Inaccessibility and so on. Then I thought, I do not want to be too literal, and right away, I thought about names of Palestinian cities of historical Palestine prior to occupation. In the aftermath of 1948, over 500 Palestinian villages were destroyed and wiped off the map. Initially, I thought to include all of the names of the cities and villages. However, due to the miniature size of my object, I decided to only do the big major cities and districts, while keeping in mind the detailed aspect for a future monumental version of the project. Then came the decision of what Arabic font to use? regular or calligraphic? I finally decided on using Arabic Calligraphy, namely Kufic. 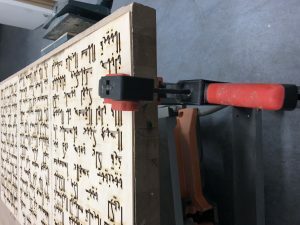 Although they are all beautiful fonts, the Kufic was the least to lose material at the negative rounded letters that would otherwise need support to keep it from falling, like when creating stencils. What else? I also thought to include an image that would be engraved into the material. At first, I wanted to include a map of historical Palestine (before 1948) as a linear background, but then again, I did not want to be too literal. Therefore, I changed my mind and thought of other alternatives. Since many of my works focus on faces and heads that are partly erased or distorted, I decided to include an image of one of those paintings. The cuts in the design will also be cuts in the image, which further serves the identity theme, another intertwining aspect of my research. In regard to the selection of material, at the beginning I was considering to use transparent material, but then I thought it would not be effective and will defeat the purpose of confinement with windows. Therefore, I decided to ultimately use wood instead. Nevertheless, I am thinking to experiment with mirrors. What will happen if the audience image was reflected into the cage walls? Would they relate more to the experience? Would they imagine themselves confined into those walls as well, and thus try to look for solutions? 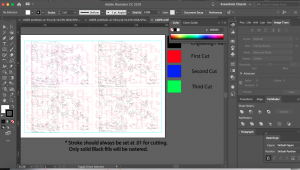 After I have decided on the final look of my design, I set to work. I started with Illustrator. 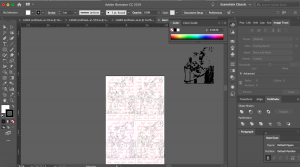 I first tried playing with the tools to familiarize myself with the software. Then I opened a new document and put in the size of my wood panel with the correct orientation: 24”x36”. I then started typing my Arabic text. I had some issues with the text not being recognized by Illustrator. This has been resolved as explained in the Challenges section. Since my design was mainly text, it was kind of easy and only used simple tools, mainly the selection tool. I then cut my work plane into 4 equal sections and changed the colours of the lines to red (blue if the job is to be done at the RPC) so that they can be laser cut. I copied and pasted the text in the four different sections, with different orders. After I changed the text into lines only and changed the font colour into red as well. I also changed the picture into linear only and moved it to the four sections. I liked how it looked like a map. This version was created for the maker’s lab laser cutter, since it can only use vector setting and do cutting and etching. However, I wanted to experiment with all aspects of the process including rasterizing. Thus, I created another version of my design, except for this time, I decided to include the full image. I copied the image into the four sections. Knowing the high cost of the design with the image, I altered the size into 18”x12”. I aligned my text and centred the images. Since the maker’s lab’s laser cutter was still not fixed, I took my designs to the RPC. When my final products were finally ready for pickup, I was happy with the results. However, the small version failed. Instead of engraving the picture, the machine engraved a blank square into the wood. 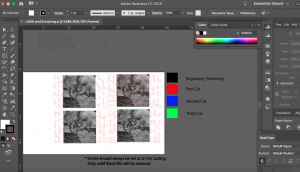 I was told that I should have transferred my image into different tones of grey using photoshop before including it into the design. This is a lesson to be learnt for future projects. For assembling the large piece, I used hot glue gun to see how it works before applying permanent wood glue. 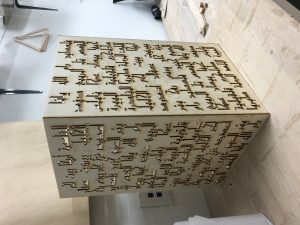 I am also considering alternative connection methods like small door hinges to connect my pieces together. 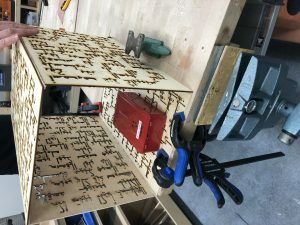 Instead of using screws to fix the hinges, I am looking into gluing those to the wood to avoid possible damage that can result from drilling holes into the piece, which can also interfere with the design cuts. For next time, I am planning to incorporate the screws’ holes into the design to have them laser cut. For the small piece, I used door hinges. I am planning to use this piece for my final DIY project. It is a room divider door. When making the big piece, I had in mind an installation piece, however, I also wanted it to be functional. I thought what would I do with such a huge piece when the art show is done? I had to think of alternatives. That is how I thought of a room divider. When the show is over, you can use it, or sell it as an artistic divider. After putting the pieces together, the screws were popping at the back, preventing the doors from folding in the desired order. To resolve this, I cut the remnants of the screws in the back. 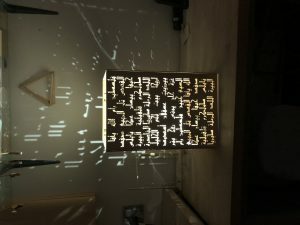 When my pieces were assembled, I experimented with projecting light from the large piece in different directions. I also thought of making a roof piece to project light to the ceiling. I love the effect it gives, as the text is projected on the large walls around, as intended. I am going to buy a revolving light that can move around and project the light in every direction. 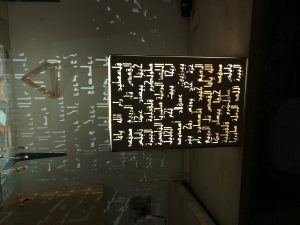 When the viewers walk into the dark room, the text will be projected into them as well, so they become an integrated part of the installation. My large piece can also be used as a lantern. 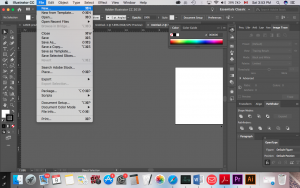 My first challenge was trying to figure out how the tools of the Adobe Illustrator work. This was resolved with the hands-on assistance of Erica. My second challenge was developed due to using Arabic text, which was not fully supported by the Adobe Illustrator program. Whatever text I wrote, it would come out reversed. The program is treating Arabic letters as English letters. Thus, they are separated and are reversed from left to right. 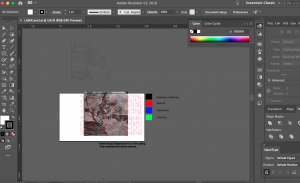 After some research, I found out that this is in fact a common problem with all of Adobe applications. 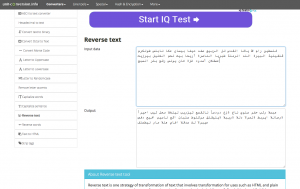 To overcome this problem, I research and used Arabic text reverser. I then copied the text in reversed letters order into Adobe Illustrator, which in turn reversed it into the correct form. My third challenge was the type of font I needed: Arabic calligraphy. It took me hours of unfruitful research, I tried to download the fonts I need from Adobe, but for some reason, it did not work. 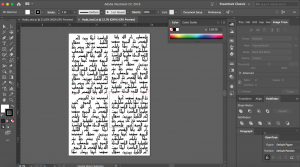 Thankfully, Mazen had the fonts downloaded into his computer and I was able use Kufic and apply it to my design. 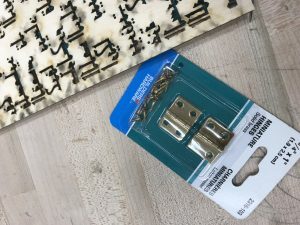 The fourth challenge was when I arrived at the maker’s lab on Saturday to do my laser cutting, I learnt that the laser cutting machine was broken, which meant I would not have my project ready for Monday. After many days of waiting, the machine was still not fixed, I eventually sent my projects to the RPC, and was able to pick it up on Friday Feb. 08. Pros: The laser cutting technology is fast and time saving. It is a great alternative for the strenuous hand-work which can take ages to finish. This is an instance where I appreciate technology replacing the hand-made. Plus, laser cutting provides clean final work which can be very tricky and sometimes hard to achieve by hand. In addition, it is amazing how various types of technologies can intertwine and combine together to produce new functional and artistic objects, and how a simple design using computer software can transform things. 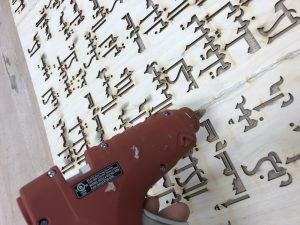 Cons: laser cutting is very costly if you want to do detailed and large work. Like for example, my project could have cost a total of $300. Luckily, I did not pay the full price. I was told that OCADU RPC is cheaper than others because it is subsidized. 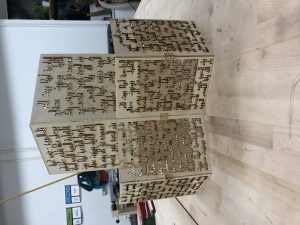 I am trying to research the most affordable way to laser cut my future projects. In contrast, handmade cutting takes so many hours of labour, which might be costlier; and precision might be hard to achieve. Additionally, it can be hard to achieve your concepts if you are not design software friendly; in this case you might want to hire a designer. If you have a concept, then that’s great. You’ve come half way into realization. If you don’t, then good luck, that’s the hardest part! Once you have it, design it, align it, laser cut it, assemble it, have a great fun with it!! Present it, exhibit it, use it or sell it. Enjoy it! 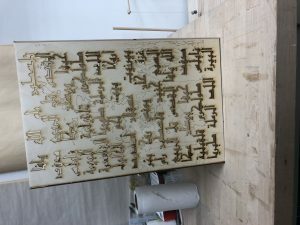 I intend to create a monumental structure of laser cut wood. My monumental installation will include every Palestinian city and village. The cities that still exists will be engraved, while the cities and villages that were destroyed will be cut off. I also intend to create 3D sculptures of the cut-out pieces left from this project. I must say I have enjoyed the process of laser cutting all the way from the concept to design to fabrication, and I love my final products. I enjoyed working on my design using adobe illustrator, which is completely foreign to me. However, with the help and guidance of Erica, I was able to make it through. 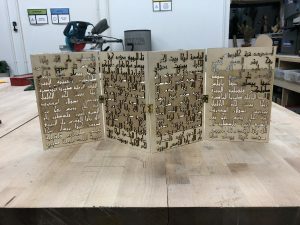 From my limited experience of working on my project, I now have a basic knowledge of the program which will enable me to experiment more and improve my skills to use this program to implement future projects of laser cutting. 12-Research: My research elements are imbedded in the above text.